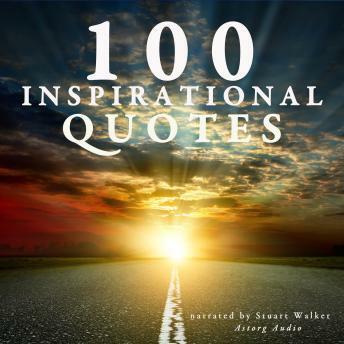 We have selected 100 great inspirational quotes to help you have a positive attitude and positive thinkings : 100 quotes that are truly inspirational and motivational. You can use quotes in your daily life to help guide your decisions in life, work and love. A great quote is very similar to a great thought and a small poem. It can encapsulate a large web of ideas, thoughts, reflections, emotions in a few words. An excellent quote requires the reader to pause to contemplate the real meaning and poetry of a few words. A great thought reaches a level of universality. Quotes hit hard into the essence of being human. Inspirational quotes are important because they activate an emotional pulse point in our hearts and minds when we are in a distressing situation. The right quote can help us to see light at the end of the tunnel, and give us that extra burst of hope and courage to persevere. The range of authors of those 100 inspirational quotes is very wide : from Seneca to Mother Teresa, from Marcus Aurelius to Woody Allen.